This recently received, and truly beautiful, image of Pluto's small satellite Nix (---> whose name comes from the Latin word for "Snow") was taken on July, 14, 2015, by the Multispectral Visible Imaging Camera (or "MVIC", for short) - located onboard the NASA - New Horizons Spacecraft - and it is, so far, one of the best images of Pluto's third-largest moon. The image was obtained at a range of about 14.000 miles (such as approx. 2.530,76 Km) from Nix. The illuminated Surface is about 12 miles (such as approx. 19,312 Km) by - roughly - 29 miles (such as about 46,670 Km). The unique perspective of this frame provides us with new details about Nix's Geologic History and Impact Record (honestly speaking, not many, but pretty big - at least as far as we can see here...). 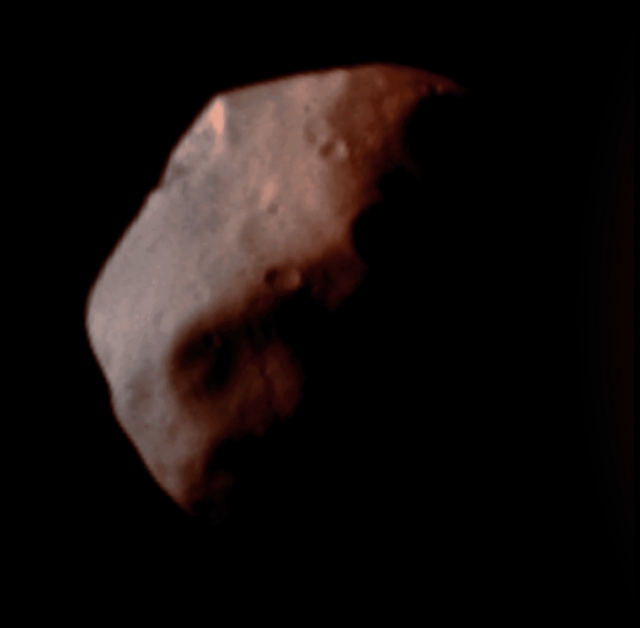 The image (which is an Original NASA - New Horizons Spacecraft's b/w and NON Map-Projected frame published on the NASA - Planetary Photojournal with the ID n. 20287) has been additionally processed, magnified to aid the visibility of the details, contrast enhanced and sharpened, Gamma corrected and then colorized (according to an educated guess carried out by Dr Paolo C. Fienga-LXTT-IPF) in Absolute Natural Colors (such as the colors that a normal human eye would actually perceive if someone were onboard the NASA - New Horizons Spacecraft and then looked ahead, towards the Plutonian moon Nix), by using an original technique created - and, in time, dramatically improved - by the Lunar Explorer Italia Team.